Patents - ICS Sp. z o. o. We are pleased to inform that on 31.10.2016 Polish Patent Office registered ICS patent application number P.419300 for an invention entitled “Fuel injector lance”. Designed fuel injector lance is characterized by a special technical solution. It is equipped with an injector, wherein the drive air is supplied to the gas mixing chamber of air and synthesis gas, through apertures arranged at a right angle to the axis of the fuel lance. Those construction of the injector is characterized by an innovative solution, because it is devoid of an element in the form of a wire cylinder placed in the flowing fuel stream, which can occur condensation of tar compounds or deposition of dust (often found in fuels used in industrial systems) contained in synthetic gas and, consequently, blocking the passage. 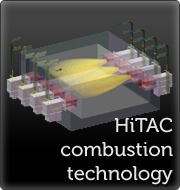 Application was created thanks to research conducted during the project realization entitled „Study of low emission technology of burning the gas fuels (low-, average-, and high-calorie) containing the higher hydrocarbons and CXHYNZ, NXHY, CXHYSZ type compounds based on the modified HiTAC volumetric combustion technology", financially supported by The National Centre for Research and Development within III INNOTECH competition program.